Let’s take a look at each one in a bit more detail. Apps, functionality, elements, text—anything on your store that is there, but visitors (especially on mobile) don’t need and can’t use should be removed. From a performance standpoint — fewer resources mean a lighter, faster website. Loading fast is always a nice quality to have. From conversion standpoint—fewer distractions on the way to clicking that “Add to Cart” button and then “Checkout” means more people will do so. The functionality and information that is on your store, needed by your visitors, but that cannot be used, needs to be fixed. This more often than not means code fixes. You’d be surprised how many things can break on mobile. From performance standpoint—broken code slows down your website because people can’t use it, but it still loads. From conversion POV—missing functionality means a red flag for the visitor. Things that are on your store and your visitors need and can use should be safe, right? Well, this is something you can improve upon and gain a competitive edge. From performance POV—you can always optimize your images, video, and code to load faster. Faster loading = higher conversions. From conversion POV—if you can save me a tap/click or two, provide the needed info when I need it the most and delight me—of course, I’ll buy from you! 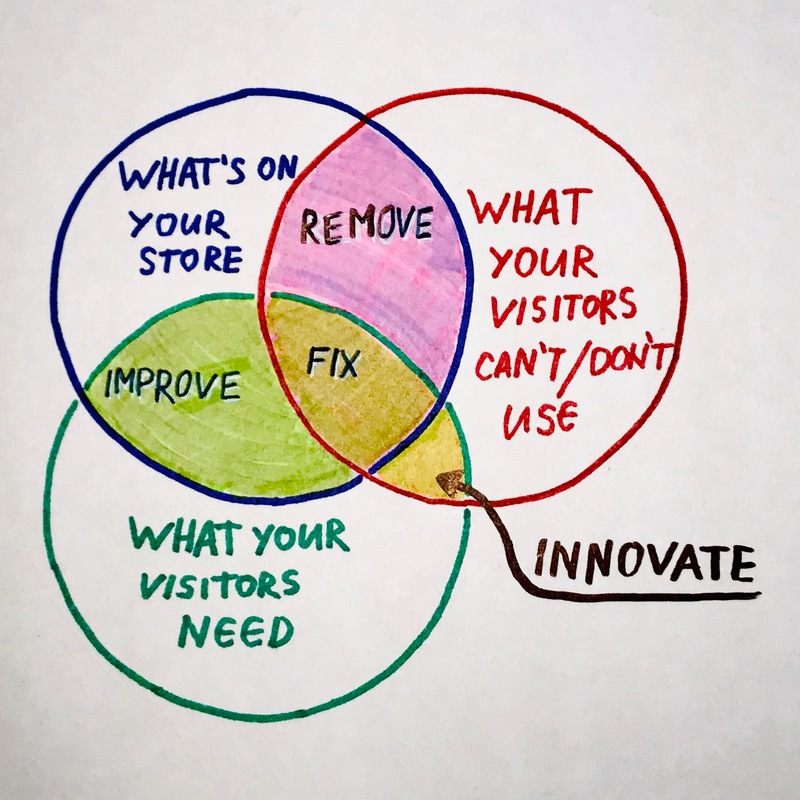 Let’s say you’ve discovered something your visitors need, but you also know that there is no solution to that problem yet. Here is the place to innovate—what if you could provide a new way for people to compare your products that isn’t available as an app on Shopify yet? This area, similarly to “Improve” is where you gain a competitive advantage. Not all optimization projects can include all 4 types of work. From type 1 to 4 the return on investment becomes higher and the risk of you wasting your time also increases. Want to improve your conversion rate quickly? Focus just on “Remove”—there is plenty that you don’t need to have on your Shopify store.